Pine trees do not require much pruning for health or to direct their growth. 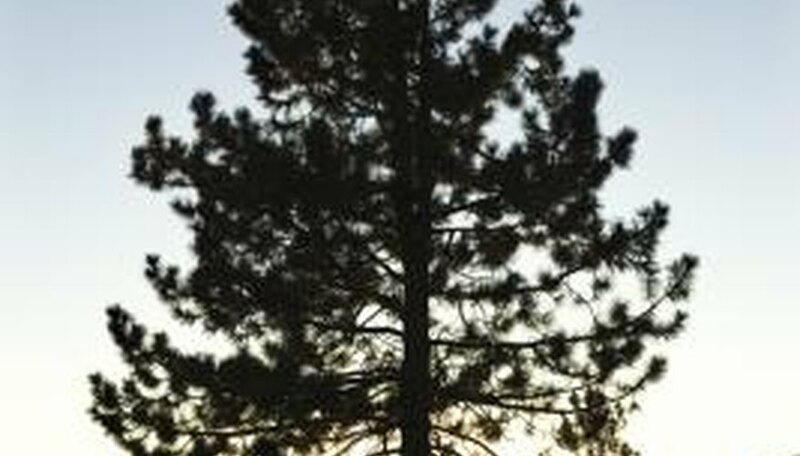 However, when branches on a pine tree pose a hazard, especially dead branches, should remove them tree. For best results, remove dead branches at the appropriate time and trim as much as necessary ensuring that the tree no longer poses a threat. The wood becomes brittle when branches die. This brittle wood may break, especially during inclement weather, creating a hazard to people, animals and structures below. Prune the branches from the tree before they have the chance to fall. Remove dead branches as soon as they are noticed if the pose a hazard. If they are out of the way, put off removing the dead branches until winter when the tree goes dormant. Do not prune in late summer to early fall because, according to Virginia Tech’s “Anatomy of an Evergreen Tree,” pruning at this time of year creates new growth that likely die during winter frosts. Clip small, dead branches with standard shears. When cutting off a small branch or limb, always cut just outside the branch collar, the slightly larger ring that forms where the branch meets the trunk. Leave the collar behind on the tree. Remove large pine tree branches with a pruning saw. Make a cut in the branch 1 to 1-1/2 feet from the branch collar up through the bottom half of the branch. Then make a downward cut roughly an inch out from your first cut, aiming the blades of the saw toward the previously made cut. When the two cuts meet, the branch should break free on its own. You can safely remove up to 1/3 of a pine trees branches without damaging the tree. However, in the case of dead branches, remove only as many branches as necessary to clear the dead wood. If more than 1/3 of the tree’s branches are dead, there is a larger problem and the tree is likely dying. It is often safer to cut down the entire tree than try to remove bits of a dying tree. Virginia Tech; Anatomy of an Evergreen Tree; Susan C. French, et al.